The island nation of Bahrain, of course, is home to the U.S. Navy in the Persian Gulf. 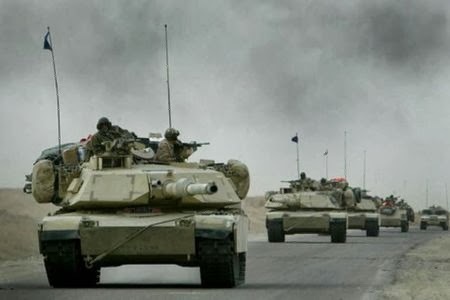 Its Sunni rulers used the U.S. weapons and training it receives for providing that naval base to shoot down and arrest pro-democracy protestors in 2011. To make sure that dictatorial order was restored, the Sunni regime on the mainland, Saudi Arabia, drove its U.S. tanks across the 26-mile reinforced causeway to Bahrain. Mandela was referring to the recreation on college campuses of apartheid-era shacks that most black South Africans lived in. Students would occupy these shacks as they asked their college administrations to "divest" the college of the stocks of any corporation doing business with South Africa. As Kristof points out in his article, there are plenty of Mandela-like political prisoners in the prisons of U.S.-backed regimes today. “Those wonderful young college students” -- and all anti-imperialist activists, of all ages -- still have a lot of work to do.